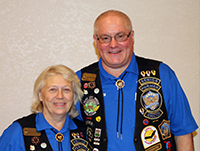 Our Association is open to all Motorcyclists, not just Gold Wing riders. ​We endorse family participation and encourage safe riding with our prime objective towards rider education as well as education of the motoring public! Go ahead and communicate with your fellow Michigan Members! Post YOUR GWRRA-MI Photos & Videos on Facebook! The District puts on two major events per year. We planned a great weekend for our Friends for FUN, SAFETY, AND KNOWLEDGE! Fun was had by all who attended! but Sidecar class is still a go!